A statewide automated phone Poll was conducted on Wednesday by MBQF, a public-affairs and consulting firm. It polled 857 likely voters who voted in at least three out of the last four elections about Arizona’s education system. The poll has a margin of error of 3.3 percent. Now I know what you are thinking, “Who ARE these people?” Given the low numbers, I’d say it is our Tea-Publican Arizona legislators and Glen Hamer and his acolytes at the Arizona Chamber of Commerce and Industry. (That’s sarcasm for the slow-witted). An astounding 27 percent (appx. 231) rated Arizona’s education funding levels as “average.” Taken together, some 40% of those surveyed said Arizona’s education funding levels are average to excellent. This does not even remotely comport to reality. The most recent report from the U.S. Census Bureau has Arizona spending less than all but two other states in overall funding from all sources; when just state dollars are counted, Arizona is ranked dead last. Arizona competes for ‘worst in the nation’ in support of public education. I have toyed with a political science theory for years that if we were to examine all the opinion surveys like this one conducted since opinion polling began, over time it would reveal that, on average, approximately 42% of Americans at any given time believe things that are absolutely demonstrably false. Sadly, when you confront poll respondents with the actual facts, they will stick to their beliefs: “Don’t bother me with the facts, I know what I believe!” Such wilful blind ignorance is how we find ourselves in the sorry state that we are in. Education and civic groups are pushing state lawmakers to use the $325 million budget surplus and $450 million in the state’s “rainy day fund” to finally fund schools at the level they say voters intended — and do it now. Julie Erfle of ProgressNow Arizona (h/t graphic) said Thursday there is an immediate need for more dollars. 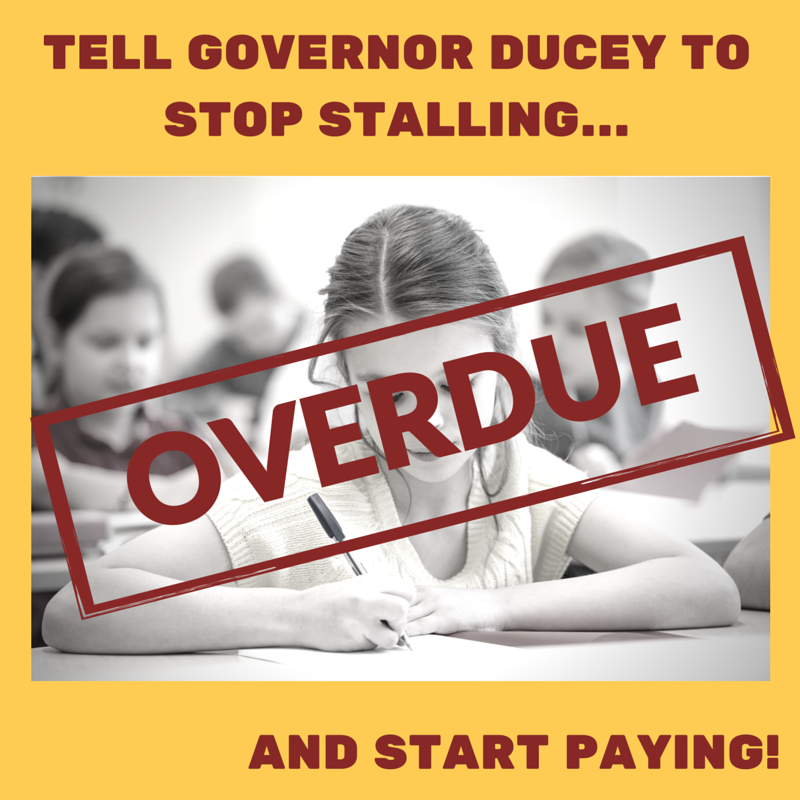 And she said with that kind of money in the bank, Arizona schools should not have to wait while a lawsuit is appealed or legislative leaders suggest alternatives. But their plea on the lawn of the state Capitol is likely dead on arrival. Gov. Doug Ducey has his own proposal to instead tap into trust land proceeds. That plan, however, not only requires voter approval but at this point would not generate any money before 2017. Senate President Andy Biggs is willing to use some of what he calls the “cash carry forward” — he won’t call it a surplus — as part of a broader plan he said eventually would generate an additional $500 a student on top of the $4,300 in state aid. But the biggest barrier to any plan to put more dollars into schools could be the attitude of many legislators toward claims that more is needed. [I]n the middle of all this is a ruling last year by Maricopa County Superior Court Judge Katherine Cooper that legislators and the governor, seeking to balance the budget, have for years ignored a 2000 voter-approved mandate to boost state aid to schools each year to account for inflation. Cooper put the amount immediately owed in excess of $330 million; she has yet to rule whether the state owes schools more than $1 billion for funds that were not delivered in prior years. With the state ending last fiscal year $325 million in the black, Jennifer Johnson of Support Our Schools Arizona said it’s time to put the issue to bed. But even with the state having weathered the deficit — and even with lawmakers having approved hundreds of millions of dollars in tax breaks for business — there is no broad consensus among the Republicans who control the Legislature about the need for additional dollars. Biggs said he is willing to push his own proposal to use a little of the surplus, tap into trust funds and see if voters can be convinced to take money from early childhood development programs to instead put into K-12 education. In other words, once again steal funds from other sources — the very thing that got the legislature into trouble for stealing Prop. 301 education inflation adjustment funds — and simply move around pots of money rather than increase tax revenues to pay for the Prop. 301 judgment, as required by the Arizona Constitution, Article IX, Section 3. Our lawless Tea-Publican legislature resorts to it always does: the ‘rob Peter to pay Paul’ plan to avoid raising taxes for education. Biggs said that could generate an additional $500 per student on top of about $4,300 the state now provides. Biggs said assuming a classroom of 20 students, that’s an additional $10,000 a year. But even if that $500 is added to current state, federal and local funds, that does not raise Arizona very far in national standings: The Census Bureau report, which had total per-pupil funding from all sources in Arizona at $7,208, put the national average at $10,700. The governor’s plan, by contrast, adds another $300 per student by simply using trust fund proceeds. In either case, the public would have to approve adjusting the formula taking money out of the trust. [Something Arizona voters have repeatedly rejected doing at the polls.] And absent a special election, that would not occur until November 2016. What our Tea-Publican legislators and governor are doing to Arizona’s children ought to be considered criminal. 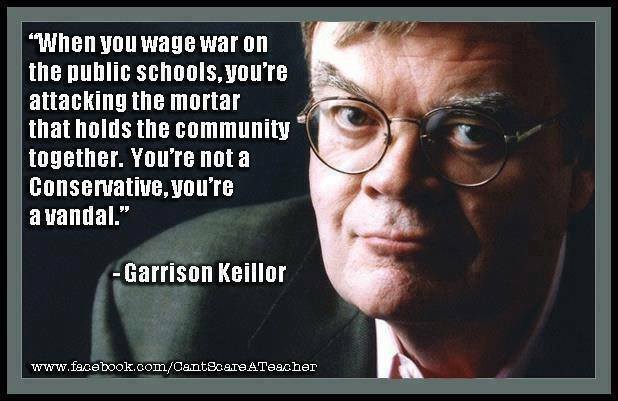 These Tea-Publicans should be doing time for their theft of education funds intended for our children. The deprivation of an education is a form of child abuse. They should have to pay more than mere restitution for their crime. To paraphrase the late Everett Dirksen, a billion here and a billion there, and you are talking real money. Except when you are talking about state school finance in Arizona. Then, $2 billion doesn’t go as far as Gov. Doug Ducey and his Republican colleagues make it seem. That’s the figure that Ducey is touting as a major infusion of cash to the state’s K-12 public schools. GOP leaders are proposing $500 million more a year after mediation over a court-ordered annual inflation increase of $330 million broke down. The problem, though, starts with how deep a hole Arizona schools are in, funding-wise. They rank next to last among the 50 states, down from 37th 15 years ago. Ducey’s $2 billion sounds like a good start, except it is over 10 years and averages $200 million a year. That is just 5 percent of the $40 billion that the state is projected to allocate to public schools at current rates over the next decade. Then there is the question of where the $2 billion is coming from, and how long it will last. The governor is proposing to tap interest on the state trust land fund at a higher rate than is currently being withdrawn, but only for a decade. And that assumes voters approve the plan starting next year. The Republican counterproposal builds on Ducey’s state trust land plan with a $100 million payment from this year’s $300 million state surplus and taking money from the $125 million a year generated by a 9-cent-a-pack tax on cigarettes earmarked by voters for pre-school programs. They contend their plan amounts to $5 billion over 10 years, or about 16 percent of projected state school spending. Meanwhile, Democrats want a judge to enforce the $330 million inflation increase and are proposing a 0.4-cent hike in the state sales tax dedicated to K-12 funding. That is less than half the 1-cent school tax hike extension rejected by voters in 2010 after fierce opposition by none other than Doug Ducey and a dark money campaign later tied to a foundation funded by the Koch Brothers. Republicans contend the 2010 vote showed voters don’t support tax hikes for education, but that proposal included money for road construction that turned off even some Democrats. Recent polls have found that five years later, a majority of voters say they are ready to pay higher taxes for schools, especially now that the economy is slowly recovering and the state treasury is running a surplus. How much more is unknown, but the survey results give the lie to assertions by Ducey and leading Republicans that they were elected on an unyielding mandate not to raise taxes of any kind for any purpose. The key to beginning to pull Arizona out of the school funding abyss must start with a dedicated funding source that lawmakers can’t touch and which the courts will enforce. It might include a sales tax hike — perhaps in graduated increments. It could also come out of other state programs — prison reformers contend that sentencing and classification changes would not only be more just and make Arizonans safer but free up hundreds of millions of dollars, too. At this point, there is nothing on the table that comes remotely close to pulling Arizona school funding even up to the top of the bottom third of the states. Minnesota and Tennessee, two states with a similar number of K-12 students, each manage to provide nearly 50 percent more per-pupil state support without shortchanging other public services. And neither has a reputation for especially high taxes. Arizona Republicans who offer stopgap school funding increases without committing to long-term solutions need to have their bluff called. That could take place in November 2016, when Ducey places his 5 percent, 10-year state trust land plan before voters alongside a dedicated, permanent school tax hike — petitions are already being circulated. And if candidates can’t sign on to that proposal, they need to be held accountable to a meaningful alternative — not just a billion here and a billion there over the next decade.